If you are a deep, deep Utopia fan and you can play keyboards, you can be a star. 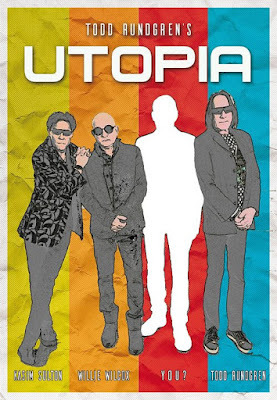 Todd Rundgren has announced that Ralph Schuckett, the original keyboard player for Utopia, has had an unexpected health issue and can't tour with the reunited band this summer. Because rehearsals for the tour start in two weeks, Todd and the rest of the band decided that, rather than try and bring another keyboard player up to speed, they would put out a call for someone who already knows the keyboard and vocal parts that would be able to hit the ground running. The catch is that they need your tape or video ASAP so they can decide on the replacement this week. As far as Schuckett is concerned, there is no word on his situation other than it must be serious enough to take him out of the picture through, at least, June. The Utopia reunion dates run from mid-April to early-June. Due to unexpected health issues, unfortunately Ralph Schuckett will be unable to tour with Utopia this spring. While discussing a replacement keyboardist, it occurred to us that there may be someone out there who already knows the music and vocal parts and would like an opportunity to tour with us. So if you think you could fill those big shoes, we invite you to submit an audio and/or video sample to us. We are on a very fast track, so the decision will be made this week. Band rehearsals begin in 2 weeks, so you won’t have a lot of time to learn the set. If you still want to try out, send your submissions (mp3s or links) to info@panacea-ent.com. If audio-only, a photo would be nice but not required. What about Paul Schaffer...he was always into all of the music that Todd (is God) played on David Letterman individually and with Utopia! Seems like a logical and natural back-up to Ralph but wishing him all the best for a speedy recovery! Come on Paul...make it happen! Todd, Kasim, and Willie are counting on you! Roger, please step up and fill this void that only you can appropriately fill! i heard they found someone but who is this mystery person! What a shame!! What's Roger Powell doing these days? Too bad he couldn't jump in. That would be awesome!